Founded in 1775, the United States Navy has protected America's freedom and secured America's interests throughout the world by outmatching America's enemies in every environment, propelling the United States to victory against some of history's most ruthless regimes. Ready at a moment's notice to protect and defend the cause of liberty on near and distant shores, the Navy's sailors and airmen have demonstrated superior skills and fearless determination. Operating a highly modernized and sophisticated fleet, they lad the world's most powerful maritime force. 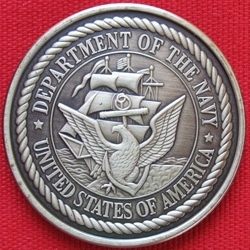 This coin salutes the mission of the United States Navy to support and strengthen America's global military advantage.